Back in 1972, then-King of Bhutan Jigme Singye Wangchuck declared, “Gross National Happiness is more important than Gross National Product.” This philosophy is ingrained in Bhutan’s culture and has guided its government since 2008. The small, landlocked South Asian country initiated a United Nations resolution that, in 2012, led to the declaration of March 20 as the International Day of Happiness. According to the UN, this annual celebration recognizes “the relevance of happiness and well-being as universal goals and aspirations in the lives of human beings around the world.” And the science backs it up: According to research from University of Warwick cited in our “The Science of Happiness” white paper, happiness increases productivity by an average of 12% – and reaches as high as 20%. Additional research from IBM® Smarter Workforce Institute and Workhuman® Analytics & Research Institute shows organizations that score in the top 25% on employee experience report nearly 3x the return on assets and 2x the return on sales. The 2019 Global Happiness and Well-Being Policy Report, produced by the Global Happiness Council (GHC), offers best practices that promote happiness and well-being – for countries, companies, and the people who comprise them. 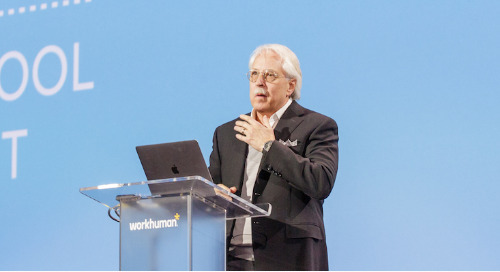 Chapter 5 features Workhuman customer LinkedIn, which found that connecting its culture to shared purpose through social recognition helped boost employee retention and performance in the face of major challenges such as compensation strategy changes, market shifts, and acquisitions. Why is this? When we make work more human by infusing gratitude into company culture through social recognition, it connects people to purpose – which motivates and empowers them to do the best work of their lives. Being recognized by managers, peers, and direct reports alike makes them feel acknowledged for who they are and what they do – and that makes them happier and more likely to stay. So, this International Day of Happiness, make it a point to tell the people working around you that you’re grateful for them and the work that they do. It could make the difference between retaining someone or rehiring for their role, but more than that, it could help someone who is feeling unacknowledged realize that their effort does not go unnoticed – and boost their happiness, morale, and self-worth in the process. Jess Huckins is a content producer at Workhuman.